I’ve got to be honest, this piece took a while to complete. 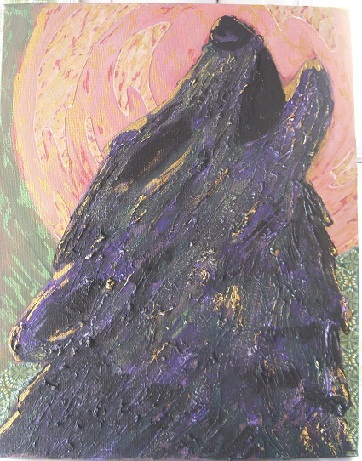 I first mentioned Time To Howl in August when I had the inspiration for the composition & color palette but not the details of how to portray this powerful animal on canvas. My intention was to collage the full moon & the wolf, yet every time I tried to find suitable fabric or paper, it just didn’t feel right so I set it aside. Wolf didn’t want to be smothered with neat little strips of fabric or subdued with flat bits of paper. Wolf is a wild thing, demanding energy & movement. But how? Patiently (& sometimes not so patiently), I waited for Wolf to speak. There was no rush. By this point, I knew that if I tried to force my will on Wolf, it would be unsuccessful. She leaned silently against a wall in my studio for months before she finally inspired me to use Liquitex modeling paste mixed with my acrylic paints & applied with a palette knife so that the hairs on her face & throat stood on end. Yes, this was Wolf as she was meant to be! Sometimes, when it comes to creating artwork, I need to make my ego (brain, logic, intellect) step aside & let the inspiration flow. Or, in this case, let the Wolf howl. This entry was posted in A Window on Life, Art and Soul, My Love for Nature and tagged art, collage, ego, energy, imagination, inspiration, moon, patience, wolf by puresusan. Bookmark the permalink.